Until about a year ago, my mother would send us each a pan of prepared stuffed cabbage to be frozen and subsequently heated and served on Simchas Torah. I never realized how much work it entailed until my sister offered our services to our mother last year in an effort to make things easier for her. We arrived at her Brooklyn home, where the makings of the stuffed cabbage were well under way. 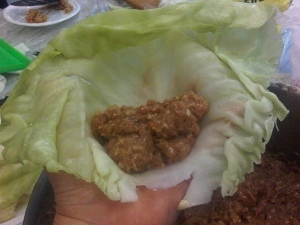 The cabbage leaves had been separated and checked for bugs, the meat mixture for the filling was prepared, and a huge pot of tomato sauce was happily bubbling on the stove. 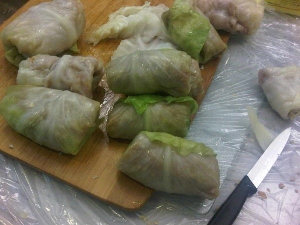 My mother showed us how to fill and roll the cabbage with meat, and put the prepared rolls into the pot as they were ready. When we realized that the stuffed cabbage would have to cook for hours on the stove, we convinced my mother that that is old school since we wanted to get home and didn’t see any reason why we couldn’t just put the stuffed cabbage into the disposable pans, give them to our respective sisters-in-law and we would all bake our own pans in the oven for a few hours. And so, we did just that. Except that after hours of baking, the cabbage was still not cooked well. My sister and I concurred that it was not working and transferred our cabbage rolls to a pot to cook properly, however, we didn’t think our SIL’s would want the extra work, so we never told them! Of course we realized what we already knew – that Mom knows best, and stuffed cabbage has to be cooked on a flame for hours and hours. No shortcuts here….. 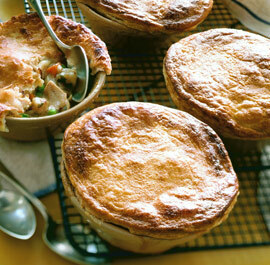 This recipe is easily adjustable to your needs. 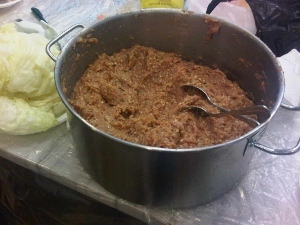 We made approximately 100 pieces using 11 heads of cabbage and 13 lbs of meat. 1. 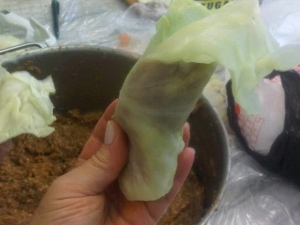 To prepare cabbage, take off the core, and drop into boiling water to separate the leaves. Flatten the spine by cutting off the part that is sticking up on each leaf (do not remove spine). Check the leaves for bugs as per Rabbinic instruction. Leaves will be dropped into boiling water again just before filling and rolling, to soften. 2. For meat mixture, combine meat with eggs, sauteed onion, garlic, salt, rice and oil if needed. Set aside. 3. 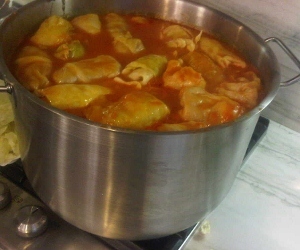 Prepare a large pot for cooking the stuffed cabbage rolls. Heat a bit of oil in a pan. Make a roux by adding an equal amount of flour to the hot oil. Add a can or more of tomato juice and half the amount of water as the juice you used. Add a bit of salt and some sugar to taste. Bring mixture to a boil and taste it to see if you like it sweeter etc. 4. Being that you will only use the large, whole leaves of the cabbage for stuffing, slice the rest of the cabbage pieces into shreds with a knife and add them to the pot of tomato sauce. roll tightly from the bottom to the top. 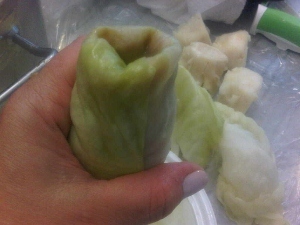 You will have one side with cabbage sticking up, so tuck it in with your finger until you have a nice smooth roll. 6. 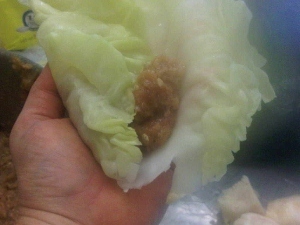 Place into the pot of boiling tomato sauce and cook for a long time until the cabbage is soft. Add a sprinkle of vinegar a few minutes before you’re ready to shut the flame.